Meet a group of savvy technicians as they create robots to be used in the future. 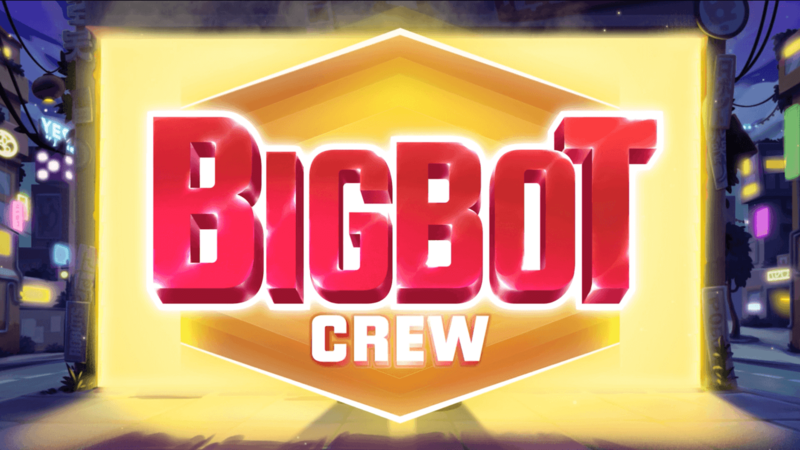 It is a whole other universe in BigBot Crew slot –And its time you found out more. BigBot Crew is an exciting 5-reel and 40-payline online slot by Quickspin. Play this game for the Big Bot wilds, respin features and the giant wild. Experience the thrilling Mystery Nudge as you sweat in the volatility of BigBot. With a 96.58% RTP and an affordable bet range of £0.40 to £100. BigBot Crew is really one of Quickspin’s most volatile games; at 4.96 out of 5. You can win up to 5, 203.2 times your stake in the special feature. Check out our reviews for top online casinos to know where to play this and other interesting online slots. Meet a group of techy teenagers and go for the BigBot (all-purpose humanoid) and win huge prizes. Time to enter this megalopolis for some techy wins! It is all about robots and technology, in the BigBot online slot. Join techy teens Matsuo, Joaquin and Danielle in their efforts to build robots for the future. There are a total of 11 symbols in this game. The low-value symbols are mechanical gears. The 3 teens and their robots make up the premium symbols. Matsuo (the red teen) is the highest-paying symbol. Land 5 across a pay line and receive 7.5 times your stake. The BigBot is the wild symbol and it appears 4 symbols high. Land 5 on a pay line for a pay out 10 times your stake. The WILD appears only on the 3 middle reels in the base game and occupies all reels in 2 bonus features. The Big Bot wild can also get into position in the base game and replace all symbols except the Bonus Scatter. Trigger this feature when 2 or more full-reel BigBot wilds land on the reels. The number of re-spins you get is equal to a total number of BigBot wilds in the triggering spin. Each Extra Big Bot wild will give you 1 extra re-spin. The BigBot wild will remain on the reels and move to the specific reel at the start of each re-spin. The BigBot wild can also move positions to activate more respins. Note that in the re-spin feature, any partial BigBot Wild can also nudge into position and fully cover the reel to increase your wins. If you have played Sakura, you might find some similarities. The outstanding difference is that the fully stacked wilds will move to the specific reels are the beginning of every spin. This means the stacked wilds can shift positions in-between respins. Land 3 bonus scatters anywhere on the reels and activates 8 Free Spins. Look out for BigBot wilds as they increase your winnings. For every BigBot symbol, you receive an extra Free Spin. Just like in the BigBot Re-spins Feature, the BigBot wild remains on the reels and moved to the specific reels at the start of every free spin. Although quite rare, it is possible to have a full screen of wilds on your first spin and win up to 400 times your stake. Get this, plus the extra 5 free spins and win up to 5200 times your bet. We like the BigBot Online slot by Quickspin. It is a future-tech inspired game with re-spins, free spins and a fully stacked wild. The best part is the 5200x potential. Even if you don’t get the total 5000x, there is a good chance of winning 1000 or 3000 times your bet. You will have great fun playing BigBot and the respins will definitely keep you on edge. With the high volatility and simple gameplay, we agree that BigBot is a well-produced and well-balanced online slot!